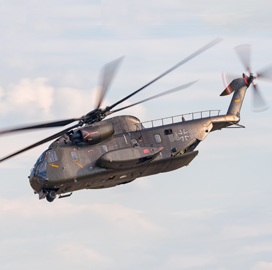 Germany’s military has cleared a plan to start the competition for a potential $4.72 billion contract to purchase 45 to 60 heavy-lift helicopters to replace its current fleet of CH-53G aircraft, Reuters reported Friday. A source said Gen. Volker Wieker, chief of staff of the German Bundeswehr, signed Thursday a document to mark the start of the competition and that the German military has not made a decision on its preferred aircraft model. The report noted that Lockheed Martin (NYSE: LMT) will propose Sikorsky’s CH-53K helicopter and Boeing (NYSE: BA) will offer its CH-47 twin-rotor aircraft. The country’s defense ministry expects to release a request for information by the second half of 2018 once the fleet capability study is completed. Germany plans to award the contract that would combine production and maintenance work by the middle of 2020 with a plan to start initial deliveries by 2023, the source said.